When my friends, Mike and Stephanie, announced they were expecting a little girl I couldn’t wait to throw them the perfect party to celebrate! 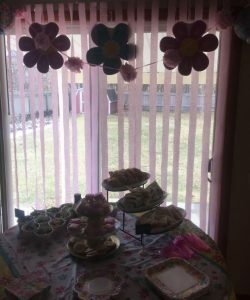 Choosing the theme was easy, as I reflected back to when I was a little girl and loved hosting tea parties. I would spend hours entertaining my stuffed animals, dolls, and older brothers. For this grown up tea party – I wanted every detail to be perfect, and to capture the essence and whimsical feelings that were often experienced when entertaining my teddy bears. 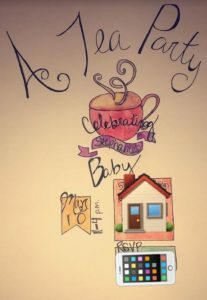 To embrace the theme, I sketched a quick tea cup with all of the party details. This was posted in a Facebook private event, and really saved on mailing cost. It also opened up dialogue for the mom-to-be to share gift needs, registry, and updates. 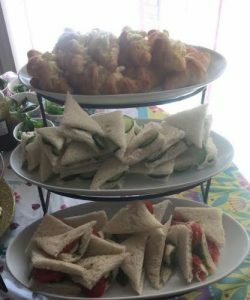 I served the mom-to-be’s favorite sandwiches, converted to tea-sandwiches. 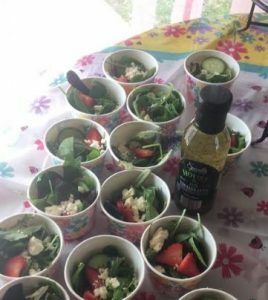 On the side, I included a mixed green salad with walnuts, feta, and strawberries. This was served with a light vinaigrette. For dessert, I made Petit Fours and sugar cookies. 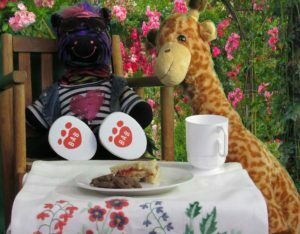 Tea parties are also reminiscent of one of my favorite Disney classics – Alice in Wonderland. 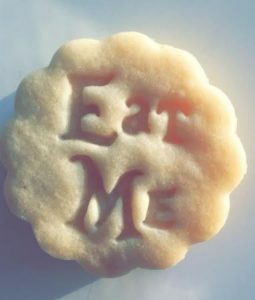 As I had to pay tribute, I found this adorable cookie cutter, because as I’ve said – detail is everything! 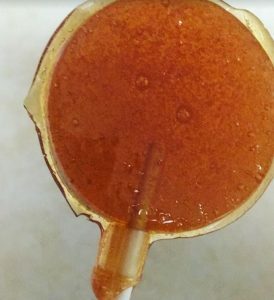 I supplied different options of teas (black, herbal, green) and made honey suckers to compliment the blends. The suckers were perfect for stirring the tea (and would be perfect if you had a sore throat). Sadly, I don’t have a lot of tea-cups… and you need tea cups if you’re having a tea party. In order to supplement, I found these great tea cups on Amazon. They were AWESOME and I have enough to utilize them for future events. Three-tier stands are a must tradition for tea parties. The stands that I fell in love with were way out of budget – so my motto: when in doubt, DIY. 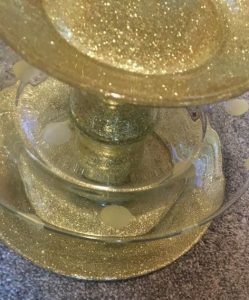 A little Mod Podge and glitter (and some other products) – pulled this stand together to be the statement piece. Check out the DIY here! I’m obsessed with party favors. The perfect party deserves a token of remembrance – and for this party, we went with a “From Stephanie’s shower – to yours” adorable rubber ducky soap. Soap is wicked easy to make. Check out my DIY tutorial. 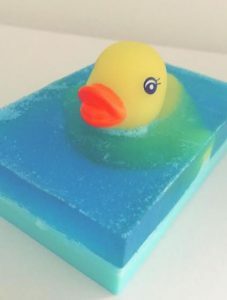 You can buy bulk rubber duckies and easily add them into the soap molds. All of my baby gifts were purchased at Target – which is kind of the best place to go. Ever. For the prizes, I wanted to embrace the tea theme and include some spa-like items. Little girls make me think of the color pink, flowers, and sweet little things. Fortunately, the Dollar Store was coming into their spring line. This gave a lot of easy and quick inspiration to make sure everything was decorated. I love Disney. LOVE. I grew up on Disney stories, and I wanted to make sure that this little one was going to start off her love for Disney as early as possible. I purchased a Disney storybook to serve as our guest book. Guests could find their favorite stories and share well wishes with mom, dad, and baby. It’s something they will have forever. This party was such a special time for me. I love celebrating milestones for my friends and family. Hopefully – you’ve found some inspiration.